. . . AND A DOLLAR SHORT? I continue to be puzzled by the lack of generosity of jazz fans in live music venues. Many people who are having a good time and yelling WOOHOO! 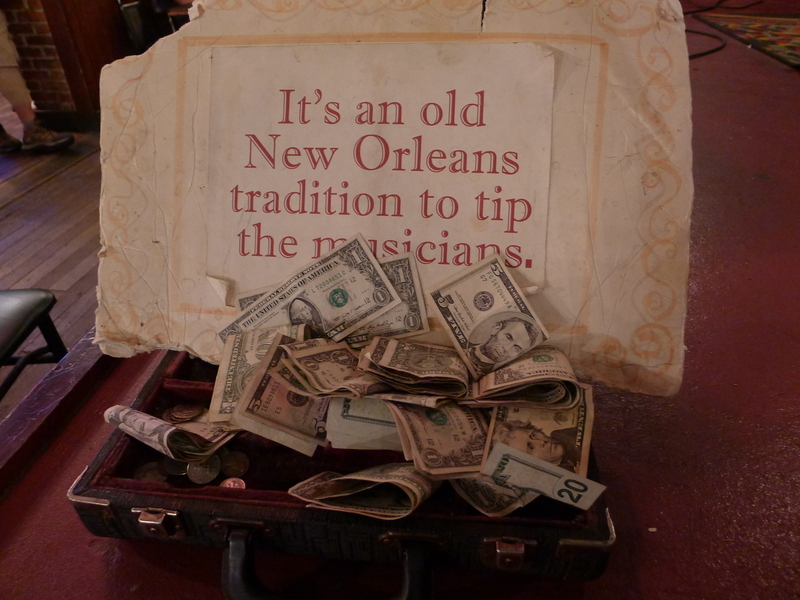 at the end of a set of inspired music by live musicians slip away when the tip jar is passed or — with visible discomfort — put a dollar bill in it. And the bill is sometimes put there under guilt-inducing scrutiny: a person (spectator, friend, or musician) moves the jar from patron to patron, waiting patiently, making eye contact. 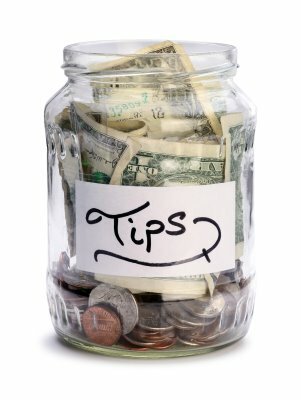 At some gigs, the tip jar sits in front of the band or on top of the piano, it may remain almost empty all night. If it can be ignored or skirted, it is. Of course there are a thousand reasons and rationalizations for this lack of largesse. “It’s a terrible economy” is perhaps the first. I couldn’t deny that. “The musicians are getting paid by the club / bar / management, aren’t they?” comes in second. One hopes so, but at what rates? That last one I like a great deal, for it manages to sound noble while the speaker’s wallet is safe, untouched. I am sure that JAZZ LIVES readers who have waited tables or served food and drink in other ways have stories of frugality (to be exceedingly polite). For many people, “tourists” of one kind or another, the lack of generosity may result from an unfamiliarity with the customs of the country, a pervasive unawareness. But if you come from far away to (let us say) New York or San Francisco and you have a guidebook, it does mention the subject. Even if the commentary is most often about waitpeople in restaurants and people who carry suitcases elsewhere, a wise tourist who wishes to be gracious can understand the significance of a jar and what might be offered to creative musicians as a tangible thank-you. Now, I know that both younger and older generations have been enabled — perhaps encouraged — to put distance between them and the music by records, radio, videos on YouTube, downloads, and more. But when a jazz fan visits an establishment where there is one person or a dozen playing instruments or singing, it is harder to ignore their tangible reality of the artists at work. They are PEOPLE. They have instruments; they sing or speak into microphones. They make eye contact. They are much larger than earbuds, more substantial than any digital download. Few working musicians are prospering playing improvised jazz, I think. Many of my heroes and heroines are singing and playing their hearts out for fifty dollars an evening. Plus tips. Or sometimes the improvisers “play for the door,” which is not a way to go home feeling well-compensated. How many of my readers would be willing to work for three hours for this salary — and that’s before taxes? And the musician, I assure you, was world-famous. He was not stacking boxes in a supermarket; he was not pumping gasoline. I would like to propose a new moral / aesthetic guideline. Of course I have no power to enforce it, except to suggest that it is both fair and kind. Those who download music from iTunes, for instance, pay close to a dollar a song. And in that case only some of that money goes directly to the artist. Wouldn’t a dollar a song be a fair starting point for compensating musicians playing live in front of you? True, you cannot necessarily stuff them into your earbuds — Newtonian physics is against it — but they are creating something right in front of you. Or, a more tangible model. A seventy-five minute CD costs fifteen to twenty dollars. 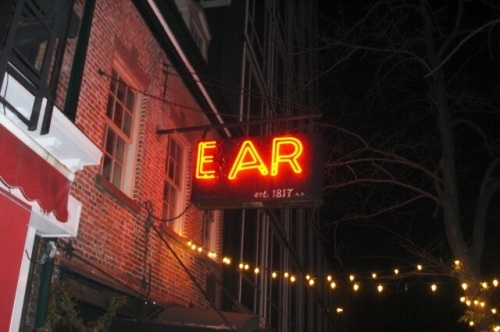 Listen to an hour-plus of music; pay the band something equivalent. I know that the “cover charge” drives some casual — and some serious — listeners away. But I wonder whether musicians are happy when they are forced to push a tip jar into people’s line of sight and wait for the dollar to be dropped in. Is this inspiring or demeaning? What might we say to the patron who has had a few glasses of win and a meal — let us say a thirty-dollar tab or less — who then puts a dollar in the tip jar under duress. Is it too much to say, “Put the cost of one glass of wine in the tip jar; fair to you; fair to them”? I do my best to be generous now, but I was guilty of this in 1972. I saw Roy Eldridge at Jimmy Ryan’s and sat the whole night nursing a $2.50 bottle of Miller beer, which didn’t taste all that good at 9 PM and was foul after midnight. In my defense, I was a college student with a part-time job who was earning $1.85 / hour. But I feel bad about it now, and wish I had been able to be more generous. I wish I could apologize to Roy and the band. I was wrong. I am sure that some listeners and perhaps a few musicians will object to the fuss they perceive me as making here. “It goes with the territory, and my heroes who played in the (insert golden decade here) didn’t make a great living, so why should I complain?” The logic bothers me. Because Johnny Dodds had a drive a taxi to be somewhere in the neighborhood of solvent, should modern musicians. Is the artist unworthy of a living wage? I think ultimately that listeners have some moral obligation to be generous to the musicians they say they admire. If they choose to lament that their favorite players are having a hard time, have they contributed tangibly to the ease and comfort of the artist? And, on a larger scale, those who lament the lack of places to play, artists being forced to take day jobs to survive — in fact, the very DEATH OF JAZZ — to give it the appropriate journalistic emphasis. Are the people who look away when the tip jar comes or drop a dollar in it killing off jazz and jazz musicians by their delicate frugalities? I please myself with imagining a State at least which can afford to be just to all men, and to treat the individual with respect as a neighbor. When the individual plays a trombone, a guitar, or sings, should we cease to be neighborly? Ponder this, dear listeners. Bills come in denominations larger than ONE. In an earlier post, FEED THE KITTY, I proposed that rather than lament the grim phenomena that surround the music we love, listeners could be active in their support. A musician friend sent the photograph below, which will serve as the objective correlative (to bring T.S. Eliot into the conversation) — the living representation and reminder of what we might be doing to keep the art form lively and healthy. I think there should be far more twenty-dollar bills than ones, but JAZZ LIVES readers will get the idea. It’s an old Southern custom! THERE’LL BE SOME CHANGES MADE! “You gotta pay the band,” according to Abbey Lincoln. This isn’t a post about putting more than a dollar bill in the tip jar: that’s for another time. This post is about responding with open hearts to the marvels the musicians create for us. Because of JAZZ LIVES, I have been having the time of my life recording live jazz performances and sharing them in cyberspace for free. I am so happy that people who can’t get to a New York club or Chautauqua or Whitley Bay can now enjoy what the musicians do so brilliantly. And my readers tell me regularly how these videos enrich their lives. Without intending to take advantage of a soul, I have made it possible for people to see hours and hours of live music for free. But the last two words of that sentence have come to seem an unfairness. Have no fear: I do not plan to stop videorecording jazz performances. To do so would break my heart. People have told me, “You are acting as an unpaid publicist. These musicians are getting great publicity and exposure!” Maybe that is true, but I think that even politely asking musicians to work for nothing isn’t right. When some New York City listeners tell me, “I don’t have to go to ____ club because I can watch the performances on your blog,” that’s not right, either. So, THERE’LL BE SOME CHANGES MADE. You know the song. I want to make JAZZ LIVES a medium for generosity and appreciation so that people all over the world can send the musicians tangible recompense for their creativity. A few musicians I’ve spoken with have dissuaded me from the iTunes model (putting a set price one must pay to view each video). I like the idea of a PayPal DONATE button. People could donate what they choose as the spirit moves them. I know that my readers would be generous! Let us give back to those who give us so much joy. It’s only fair! UPDATE: HERE’S THE LINK! CLICK ON IT, WON’T YOU? All true. And in conversations with the musicians themselves, they tell me that the reality is often worse than I imagine, emotionally, economically, and artistically. Joy won’t pay the electric bill — but if you don’t have it, you are sitting in the dark. And it’s a kind of darkness that can’t be illuminated by a light switch on the wall.